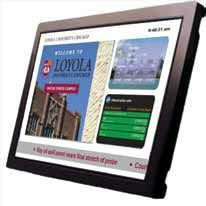 University campus deployment is one of the rapid growing digital signage applications today. The digital signage screens on campus are becoming integral part of the university communications. To qualify for a university digital signage network operating platform, the system not only needs to meet the usual enterpriseclass level of sophistication and reliability, it must also pack a set of tools and ready-to-use widgets to connect to the established university applications for feeding the live data to screens automatically. Leveraging the success of DYNASIGN Online digital signage SaaS and the expertise learned from university clients over the past few years, Dynasign is launching DYNASIGN Campus Live — an SaaSbased digital signage solution plus a library of presentation templates that enable the university screenmedia network operators to seamlessly integrate live data feeds from popular university applications. Screens on university campus are not a new concept. The university channels or campus TV have existed for decades. With modern digital signage technologies, each screen is capable of displaying the individualized content programs contributed in real time by multiple sources and functions within the university organization and beyond. The access to the content programming is no longer relying on and limited to a small, dedicated campus TV group of resources that are usually short-handed in handling the requests from departments and functions. Through the easyto- access and easy-to-use web-based content management user interface, the content contributions to designated screens become seamless collaborative efforts. The end result is that each screen on university campus is an effective communication tool to show the relevant contents to the right people at the right location at right time. DYNASIGN Online provides a cloud-based digital signage management platform. The standard features include flexible screen zoning design, vast content format support, granular login access control, dynamic playlist aggregation, easy-to-use web based management UI, live data feed engine, on-demand interactive/ kiosk layer, flexible network connectivity, video wall configuration, unlimited scalability, and ready to use AP News and AccuWeather feeds. With the all-inclusive SaaS model and superior customer support, Dynasign established a solid reputation and client base in education industry. Dynasign has been powering some of the largest university networks in U.S.